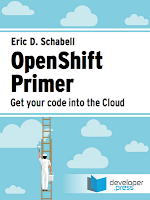 It started a little over a year ago, the first talk that I coined the term 'OpenShift Primer' was given in Amsterdam. It was born from a need to get the general developer public up and running with Red Hat's OpenShift Platform as a Service (Paas) project. Not just up and running as in getting it installed, but actually getting started coding with real projects. In the middle of this I started collecting the pieces together for this book. It is available via developerpress.com in e-book format only, pushed out to Amazon and iBooks. This is perfect timing for you to stuff some stockings for the holidays!